With numbers of regular cyclists in Northern Ireland rising, especially in Belfast, 2013 should be a year of steady progress on cycling issues. However ongoing government spending cuts, alongside the natural disinterest of the authorities to transport and utility cycling, mean radical ‘big ticket’ cycling projects are unlikely to be pedalling up the agenda. But instead of being deterred, we need to organise and innovate! Since I started blogging about Belfast cycling I’ve seen amazing resourcefulness and passion among local people who choose to get around by bike. New community connections are being built every day, and spawning innovative action such as Reclaim Belfast’s Cycle Lanes 1 and 2. It is among the people who ride our streets every day that we will find creative solutions to change the experience and perception of cycling here. So here are 13 ideas for simple, realistic, achievable improvements to Northern Ireland and Belfast cycling that can be pursued despite the austere economic circumstances. These include suggestions from regular Belfast cyclists. Please feel free to add your own ideas to the comments section! In no particular order..
Road safety authorities have been rightly praised for a record year for road safety in Northern Ireland. While every death on our roads is a tragedy, it is heartening to see numbers falling year on year. Yet looking behind the headlines, there is a worrying trend of rising cycling casualties. With greater numbers of cyclists observed and expected on our roads, Roads Service and DOE must acknowledge the developing problem, look into any underlying reasons, and develop a plan to improve the situation. More detailed road safety statistics, including KSI rates per million journeys in NI for different road users, are available on the DOE website. 2012 saw the welcome inclusion of cycling in a higher profile DOE media campaign, and a dedicated cycling awareness drive – which avoids patronising cyclists – could be a good start in 2013. 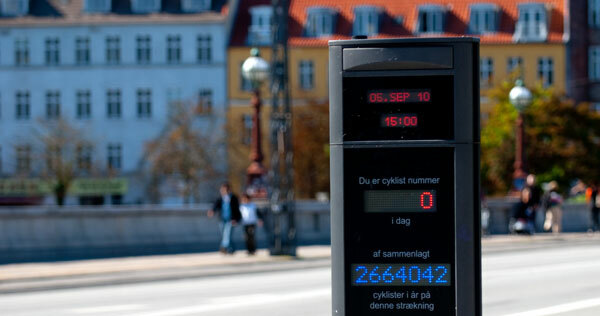 Copenhagen is just one city where highly visible counters show real time cycle traffic stats. This helps to highlight cycling as a commuter choice, and can be a strong statement for Belfast, even if numbers are low – we’re a city that is proud of our cyclists. Ask any regular cyclist and they’ll tell you Belfast cycling has seen an explosion in number over the last 18-24 months. Belfast is in real need of a cycling census, a regular check on actual daily flows around key points. DRD cycle counters have logged increases of over 200% (PDF, 499Kb) between 2000 and 2010 in some areas of Belfast. But the reports, just like the counter devices themselves, take some finding. Placing a counter on a key shared arterial route will add a sense of pride to regular cyclists, and a help to encourage others to join the growing cycling community. The dismissive nature of most official responses has been disappointing, if not unexpected. It highlights a cultural change needed in government, as well as on our streets. New traffic management measures promise much, but have yet to deliver change. This is the year Roads Service needs to admit the problem, raise the priority in line with so much active travel rhetoric, and put a cycle lane action plan at the heart of parking enforcement. Following the (yet to be published) Northern Ireland Active Travel Strategy, Belfast City Council is working on a complementary vision for the city. The NI document is expected to aim for an overall cycling modal share of 1.5% by 2020 – startlingly modest, even of that represents a doubling by some measures. Belfast already has a broad commuter modal share of 2.1% as of 2011, and further census figures to be released in 2014 will show even higher rates in the 0-10km target range for urban cycling. It is for this reason, along with the 60% rise in commuter cyclists over the last 10 years, that Belfast demands a wholly separate cycling strategy. The Active Travel Strategy, while not exclusively focused on cycling, presents a real opportunity for a first step to setting challenging and stretching targets for urban cycling, driven by an ambitious local council. Those tasked with producing the document could do worse than to draw on existing cyclists’ knowledge of commuter routes, perhaps utilising basic online mapping and geotagging tools, to crowdsource the main areas for improvement. Pushing for transport infrastructure budget reallocation will only be successful if political will and leadership is demonstrated by Belfast. This document can be a key tool to advance the cause of cycling for transport in Belfast. Everyone knows what’s wrong with cycling in Belfast – fragmented and inconsistent cycle routes, illegal parking blocking access to advisory cycle lanes at rush hour, cycle boxes with no direct access, few separated cycle paths, dangerous junctions and pinch points, poor civic and work facilities, bin lanes instead of cycle lanes – but little time is spent describing in detail what is required to upgrade the infrastructure. The success of cycling in the Netherlands, Copenhagen, and to differing extents New York, Montreal, Seville and London, is due to the quality of the cycling routes, with an end-to-end approach to planning. Belfast needs at least one demonstration ‘quality cycle corridor’, with every aspect of the route studied and adapted to find the best and safest solutions to moving cyclists from A to B, and all the Cs along the way. Yes, this probably means a deal of separation, but not every arterial route absolutely must cater 100% for motor traffic. Belfast even has strategic roads with plenty of space for Dutch-style separation, but we don’t appear to have the wit to try it. Let’s get the discussion started on what real progress could look like. This is a difficult selection given the difficulties police are facing on a daily basis across Northern Ireland with flag protests. But the occasionally exceptional nature of Northern Ireland society and policing should not deter us from seeking safer roads. A common complaint from cyclists is vehicles blocking advanced stop line cycle boxes. A recent Freedom of Information request reveals that PSNI do not distinguish between different types of stop line offence, meaning specific statistics on cycle box infringements are not collected. This unfortunately obscures both the prevalence of the problem, and the sense of priority given to enforcement. Belfast has a great number of dangerous junctions where cyclists are required to take risks to filter towards cycle boxes. For example, see picture – there is a third lane to the right of the van. For the sake of transparency, PSNI must begin to record cycle box offences separately. The Comber Greenway is rightly lauded and strongly defended as a key community resource in Belfast. Whether for walking the dog, running down the energy of the kids, leisure or commuter cycling, or just a proper dander, it’s a little gem in the city. And then winter arrives. Between October and March anyone using the Greenway after 5pm does so in darkness. Cyclists need a strong light, and to be on their wits to avoid pedestrians or dogs in the gloom. Walking alone in the dark just isn’t an attractive option. And when frost and ice arrive, the path becomes lethal, regardless of how you’re getting about. Putting the Greenway (and Laganside paths) on the gritting schedule, and designing plans to install early evening lighting on urban sections will ensure key transport corridors are available for use all year round. In 2012 Roads Service served up a cold reminder to cyclists of their place in Northern Ireland society. A consultation on a plan for allowing taxis into bus lanes was roundly rejected by 86% of respondents. Yet DRD dismissed opposition with a single comment of contempt – “those were mainly from cyclists”. So Roads Service will press ahead with no additional review of the impact upon cyclists and cycling rates, so sorely missing from the original consultation document. This token consultation exercise hasn’t changed DRD’s mindset, but the real fears of cyclists must be addressed. As with access for cyclists and motorcyclists before, so taxis in bus lanes must be introduced on a pilot basis, with close monitoring of the effects on cycling traffic and any increase in collisions, with retention of other options if it proves detrimental. Started in Bogota in the 1970s the idea of temporarily closing a section of a city to motor traffic, for the exclusive use of pedestrians and cyclists, has spread around the world. This would be a great way to promote the benefits of sustainable travel options in Belfast, and could be turned into a weekend mini festival to attract new customers to shops, cafes and restaurants. The Ormeau Road or Stranmillis Road are two prime candidates, with direct NCN cycle route access, parks, and good diversionary routes for normal traffic. In early 2013 we will see a 20mph Bill introduced at the Assembly, developed by SDLP MLA Conall McDevitt. This aims to bring Northern Ireland into line with the developing movement across Europe for safer residential streets. Existing 20mph/30kph zones demonstrate the benefits of lower urban speed limits to the quality of neighbourhood life, casualty survival rates, and increase in active travel. No doubt there will be fierce resistance from certain lobbies, but this is a key element for cycling in Northern Ireland and especially urban areas. Strong support will be required to progress this Bill in a form that will benefit Northern Ireland society as a whole. All-party groups provide a forum for MLAs to engage with the public and interested organisations on important topics. The idea of an all-party cycling group at Stormont has been knocking about for a few years now, but little progress has been made to actually constituting a group. Such groups are working diligently at Westminster and Holyrood, and it is time for politicians at Stormont to add cycling to the list of ‘normal’ mainstream politics, as Northern Ireland continues to be mired in tribal issues. The Northern Ireland Assembly has its share of cycle-friendly politicians, and providing a voice and forum within the heart of the local administration can only help to speed progress on cycling issues. Cycling in Northern Ireland is quite a fractured specialised set of groups, with varied and even clashing aims and opinions. Urban cycling – specifically commuter, utility and transport cycling – has been developing links and the beginnings of an identity. Action such as Reclaim Belfast’s Cycle Lanes has brought people together in new ways to tackle specific issues. There is momentum in so many areas of cycling in Belfast and Northern Ireland, and people can really see the potential for meaningful change. Major hurdles remain stubbornly rooted, and the best chance to overcome problems and demand real change is by sticking together and growing bonds of community. Hopefully 2013 will be an interesting year for building concerted action. >> Thanks to everyone who interacted with NI Greenways in 2012! So that’s a wish list for 2013 – some quite realistic, others less so. What do you think of these, and do you have any more ideas which could be pushed forward? Comments are open! ← Cycle to work: a New Year's resolution?